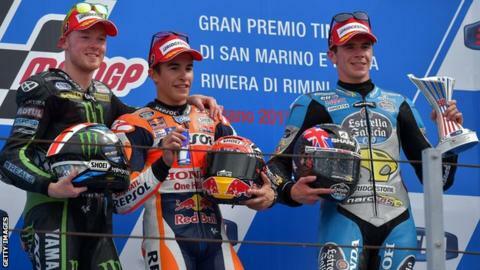 World champion Marc Marquez won a thrilling San Marino MotoGP at Misano as two British riders finished on the podium for the first time since 1979. Yamaha's Bradley Smith finished second amid changing weather that saw most riders forced to make two pit-stops. Honda's Scott Redding claimed his first podium finish in third, despite sliding into the gravel early on. All three capitalised after Valentino Rossi blew his chances with tactical errors and Jorge Lorenzo crashed out. The last time two Britons shared a podium in a premier-class grand prix was in Venezuela 36 years ago when Barry Sheene won the race and Irishman Tom Herron came third. Early rain proved crucial on Sunday, with Honda rider Marquez switching to slick tyres just as the Misano circuit started to dry. Championship leader Rossi and his army of home fans were left frustrated after he led with seven laps to go but left the switch from wet tyres to slicks until too late, which handed the race to Marquez. Rossi eventually finished fifth but thanks to Lorenzo's crash the 36-year-old still extended his championship lead to 23 points over his Yamaha team-mate. Marquez, who sits in third spot 63 points behind Rossi with five races to go, explained that problems caused by the weather were made more difficult by the recently re-laid track surface. The Spaniard added: "The asphalt is new here and very dark, so it was hard to tell if it was dry or wet. It was really difficult out there but we made the right decision with the tyres." Smith was delighted to claim the second podium finish of his career after sticking with slick tyres at the right time. The 24-year-old said: "I kept telling myself that luck favours the brave, went with my instincts and it turned out to be a good day." Redding rode a remarkable race after sliding into the dirt, only to get back up and push his bike back on the track. The 22-year-old said: "When I went into the gravel, the marshalls tried to hold me back but I was fighting to get on the track. "It was an incredible race and the adrenaline was through the roof. We took a lot of risks and we got some rewards."